Are you trying to order new coffee pods on Amazon? First of all: Shame on you. 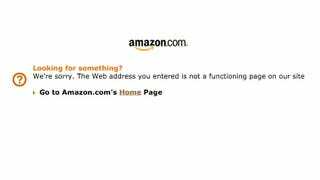 Second of all: You can’t buy anything on Amazon.com because the website is all sorts broken right now. There are multiple reports of the site going down this afternoon. That’s the error screen above. Some pages will load after many seconds, but then the links don’t work. It’s a big mess. Amazon Web Service isn’t reporting any outages which deepens the mystery. We’ve contacted Amazon to see what’s up. Clearly, something’s wrong. Update 3:05pm: Everything appears to be fine now. Unless you live in China, where there are some fundamental problems with accessing internet websites.